In Cyclops (episode 12 of Ulysses) a religious procession descends on Barney Kiernan’s pub, including many saints: real ones like St Bernard and St Ita, as well as parody names like St Anonymous and St Eponymous. The list of saints is followed by a list of saintly attributes like harps and swords, “babes in a bathtub” and “eyes on a dish”. In English Wilgefortis is also known as St Uncumber and St Ontcommer in Dutch. 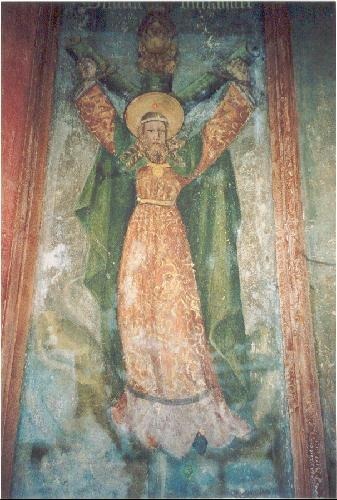 This painting of St Ontcommer is in St Stevenskerk in Nijmegen in the Netherlands.